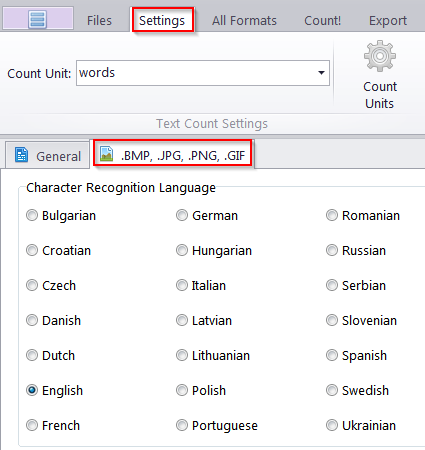 What languages are supported by AnyCount 3D Enterprise for Image OCR? Anycount 3D Enterprise can recognise image text in the following languages: Bulgarian, Croatian, Czech, Danish, Dutch, English, French, German, Hungarian, Italian, Latvian, Lithuanian, Polish, Portuguese, Romanian, Russian, Serbian, Slovenian, Spanish, Swedish, Ukrainian. You need to select the requiredlanguage in the settings before counting.